Every summer seems to serve up some sort of GAA-inspired music, though the quality can vary radically (remember Johnny B and the Boogie Men? ).The formula is generally some kind of Big Tom-light, by the books country n' western ditty rounded off by a less-than-clever chorus. I don't think we've a contemporary GAA song as catchy as Rory And The Island's 'Jimmy's Winning Matches'. It's quite like the Donegeal team it celebrates: fresh, a little bit different, irresistible. After first being featured on Balls.ie with about 100 youtube views, 'Jimmy's Winning Matches' has now been seen over 200,000 times. Interestingly enough, the song originally had nothing to do with gaelic football or Jim McGuinness. Quick backstory - Rory of 'Rory and the Island' is Rory Gallagher from the Revs, the early-noughties pop-punk band with Kilcar roots. The Revs broke up in 2007 and Gallagher relocated to Lanzarote, and started earning money gigging at pubs like Charlie's and Craic n Ceol. Last summer, he started performing a song called 'Jimmy's Selling Watches' - a song inspired by a guy called Jimmy or Jimmy Barry Murphy, a Senegalese immigrant living on Lanzarote who travels from pub to pub selling fake Rolex's and singing Irish songs like 'Molly Malone' and 'Fields of Athenry'. Jimmy seems like something of a legend (and I'd love to hear him tell the story of how he arrived in Lanzarote). Here's Rory and the Island with Jimmy and Sharon Shannon performing the song in Lanzarote last year. The song enjoyed what you might call modest success. Rory also made a small splash with a Galway Girl-themed Euro 2012 song early this summer but it was a seamlessly retooled version of 'Jimmy's Selling Watches' featuring Jimmy himself namechecking towns in Cork and Dublin in a song now toasting the achievements of Glenties man Jimmy McGuinness that earned Rory and the Island genuine attention. 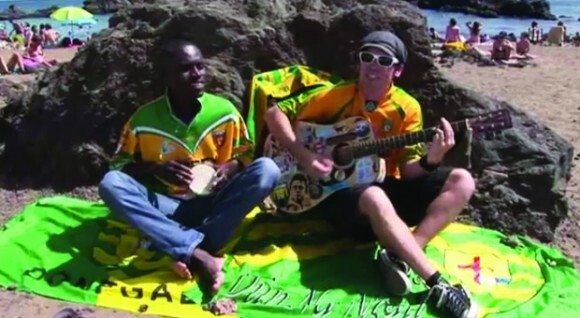 The video was shot quite simply on a beach featuring a few Donegal jerseys and flags and in just under three weeks time, 'Jimmy's Winning Matches' became the soundtrack to the summer in the northwest. A meet-up between the two Jimmy's now seems inevitable. And as we said last month, Rory and Jimmy better be on 'Up For The Match' in a few week's time.